This paper describes a method for automatic analysis of the choroid in OCT images of the eye fundus in ophthalmology. The problem of vascular lesions occurs e.g. in a large population of patients having diabetes or macular degeneration. Their correct diagnosis and quantitative assessment of the treatment progress are a critical part of the eye fundus diagnosis. The study analysed about 1’000 OCT images acquired using SOCT Copernicus (Optopol Tech. SA, Zawiercie, Poland). The proposed algorithm for image analysis enabled to analyse the texture of the choroid portion located beneath the RPE (Retinal Pigment Epithelium) layer. The analysis was performed using the profiled algorithm based on morphological analysis and texture analysis and a classifier in the form of decision trees. 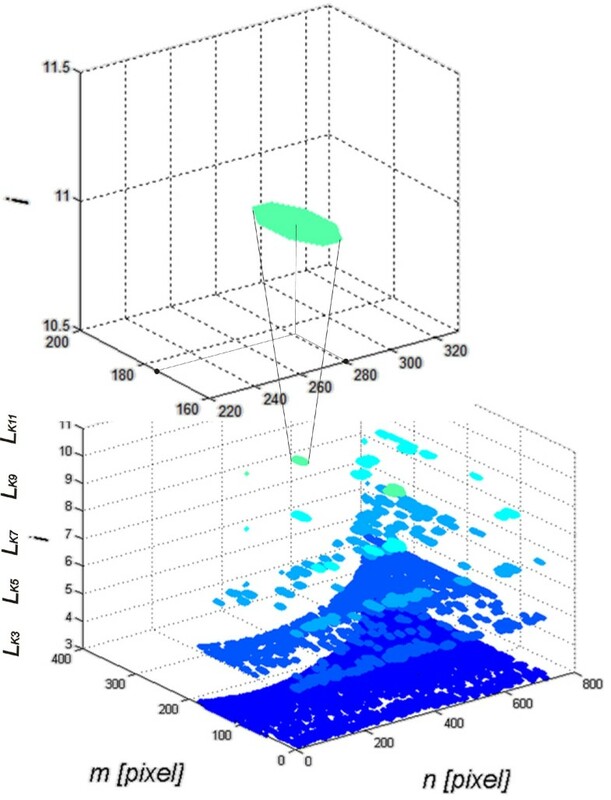 The location of the centres of gravity of individual objects present in the image beneath the RPE layer proved to be important in the evaluation of different types of images. In addition, the value of the standard deviation and the number of objects in a scene were equally important. These features enabled classification of three different forms of the choroid that were related to retinal pathology: diabetic edema (the classification gave accuracy ACC 1 = 0.73), ischemia of the inner retinal layers (ACC2 = 0.83) and scarring fibro vascular tissue (ACC3 = 0.69). For the cut decision tree the results were as follows: ACC 1 = 0.76, ACC 2 = 0.81, ACC 3 = 0.68. The created decision tree enabled to obtain satisfactory results of the classification of three types of choroidal imaging. In addition, it was shown that for the assumed characteristics and the developed classifier, the location of B-scan does not significantly affect the results. The image analysis method for texture analysis presented in the paper confirmed its usefulness in choroid imaging. Currently the application is further studied in the Clinical Department of Ophthalmology in the District Railway Hospital in Katowice, Medical University of Silesia, Poland. –scarring fibrovascular tissue a uniform image proves its presence in most patients [7–9]. These types of images are presented in Table 1 they are subject to further analysis. The study analysed about 1’000 OCT images acquired using SOCT Copernicus (Optopol Tech. SA, Zawiercie, Poland). The patients ranged in age from 12 to 78 years and had different types of choroidal structure. It was a group of patients routinely examined, analyzed retrospectively and anonymously. The routine tests were carried out in accordance with the Declaration of Helsinki. The images were acquired in DICOM or RAW format with a resolution of 256×1024 pixels at 8 bits per pixel. Image analysis was carried out in Matlab with Image Acquisition Toolbox and Signal Processing tools (version 4.0 and 7.1 respectively), whereas code optimization was carried out in the C language. 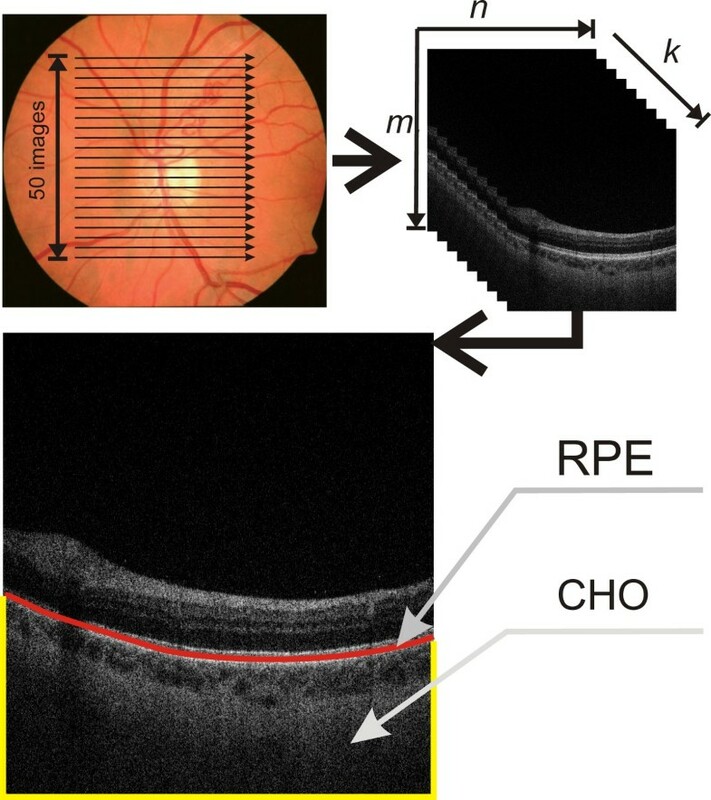 The proposed algorithm for image analysis enabled to analyse the texture of the choroid portion located beneath the RPE (Retinal Pigment Epithelium) layer. The analysis of the choroid was performed using the new profiled algorithm based on texture analysis and mathematical morphology that is described below. The division into types of images (3 groups) was carried out by an ophthalmologist for 1′000 images representing learning, validation and test groups (proportion: 60%, 20%, 20% respectively). At this stage, patients with other type of images were also eliminated from further analysis - only images with visible alterations in the choroid were further analyzed. m,n – coordinates of rows and columns of the matrix m∈(1,M) and n∈(1,N). The method for obtaining tomographic images of the fundus. For a sample 2D tomographic image, the RPE layer (retina pigment epithelium) and the choroid layer CHO are highlighted. Image analysis applies to the proposed algorithm which analyses the choroid layer using new methods of texture analysis and mathematical morphology. In each case, a flat two-dimensional input image is analysed, whose resolution (and that of the OCT apparatus) does not affect the obtained results. The course of image pre-processing. 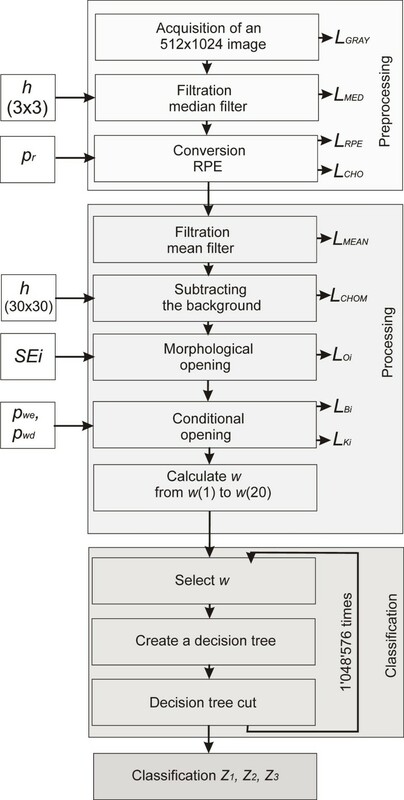 The subsequent steps of L GRAY image analysis: filtration with a median filter – L MED , determination of the RPE layer (retinal pigment epithelium) – y RPE (n), coordinate system conversion – L CHO . These steps are part of the image pre-processing which is necessary for further analysis of images. p r - coefficient determined in the range from 0 to1. The value of the coefficient p r  is determined once for the Equation (2) and is 0.9 (it was determined arbitrarily). Depending on its selection (p r ), the number of pixels that influence the calculation of the median is changed. An increase in the value of p r increases the number of pixels from which the median is calculated. Equations (2) and (3) by selecting p r enable correct calculations of the RPE layer individual points only if there is one cluster. In other cases, when there are two or more clusters, the calculations are more difficult. These are cases where the RPE layer is not the brightest layer for the analysed column. Such situations are very rare. The specificity of the Equations (2) and (3) enables to receive values equal to M (last row) for cases where none of the pixels is larger than maxm ∈ (1,M)L MED (m, n) * p r for the analysed column. The values of “-1” added to the matrix L RPE enable to distinguish the area above the RPE layer from the pixels beneath the RPE with a value of “0”. The final element of image pre-processing is affine transformation of the image L RPE to the image L CHO containing only the interesting area of the choroid Figure 2. The image L CHO includes all the pixels of the image L RPE from the layer y RPE (n) to the last row (M). The remaining space in the matrix L RPE is filled with the values “-1”. Thus prepared image L CHO with a resolution M C ×N C is subjected to appropriate analysis and processing as described in the next sub-section. for m∈(M h2 /2, M C -M h2 /2) and n∈(N h2 /2, N C -N h2 /2). These images (L Oi ) after normalization to the range 0 to 1 may be subjected to binarization at a constant threshold p r .
s rd – the mean value of the analysed area for dilation. Image analysis of the sequence of images L Ki . Subsequent results are shown for i∈(3, 5, 7, 9, 11). For each image L Ki and thus for each i the values of the features from w(1) to w(20) are calculated. For example, one of the objects whose coordinates of the centre of gravity are calculated is shown on the top of the zoom – in this case, they are (176, 281). The features w(6) to w(16) are the mean value of gravity centre coordinates of all objects in the image L Ki . These features were selected taking into account medical conditions. They are related to the location of vascular lesions from w(6) to w(15), uniformity of brightness distribution within these changes from w(16) to w(20) and the area of changes for the appropriate number of objects from w(1) to w(5). These characteristics form the basis for building a classifier using decision trees (Figure 4 shows the block diagram of the algorithm). The block diagram of the algorithm. The block diagram is divided into three main parts, namely image pre-processing using the known techniques of image analysis and processing, the principal analysis of images proposed by the authors and the classifier based on decision trees. The individual processing blocks are described in detail in the paper. The values of the 20 features obtained (four different types) are further used to build a decision tree. An ophthalmologist divided more than 1′000 images into three groups (Z 1 , Z 2 or Z 3 - Table 1). The division into groups Z 1 , Z 2 or Z 3 was performed manually by an ophthalmologist. As a result, the following frequency of occurrence of choroidal imaging was obtained: the group Z 1 included 23% of all cases, the group Z 2 included 44% of all cases, and the group Z 3 included 33% of all cases. This corresponds to 233, 436 and 331 images respectively. Whereas the division into learning, validation and test groups had the following proportions: 60%, 20% and 20% respectively. These groups were formed after rejecting the images with a mixed character of the changes observed - the type of the disease was not a criterion for exclusion here. A variety of overlapping diseases can be found in the excluded images. The cases of spatially invisible layer of choroid, images resulting from the errors in the acquisition or lacking a visible layer of RPE (for various reasons) were also excluded. Due to the fact that these are retrospective studies, the excluded images did not often cover the full range of the choroid, were deliberately obscured or distorted at the acquisition stage. –for Z 3 – SPC 3 = 0.88, TPR 3 = 0.097, ACC 3 = 0.63. The complete classification tree. The decision tree was created for the classification of imaging types Z 1 , Z 2 , Z 3 for the features w(1) to w(20). 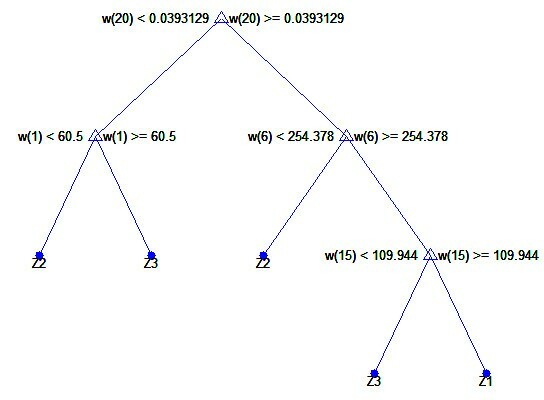 The characteristic elements such as the presence of the feature w(20) in the first node of the tree and successively features w(1), w(6) and w(15) for the other nodes are visible here. The results obtained on this basis are, for example, SPC 2 = 0.56, TPR 2 = 0.86, ACC 2 = 0.70 for Z 2 . (where: SPC = TN/(FP + TN) – specificity, TPR = TP/(TP + FN) – sensitivity, TN – true negative, TP – true positive, FN – false negative, FN – false positive, subscripts “1”, “2” or “3” indicate the type of images). A closer analysis of the resulting decision tree enables, at this stage, rough assessment of the importance of individual features. For this form of the complete decision tree, there occur only features w(1), w(6), w(15) and w(20). Additional information is provided by the ROC graph (Receiver Operating Characteristic) designated for Z 1 , Z 2 , Z 3 to assess the impact of individual features from w(1) to w(20) separately. This graph (ROC) is shown in Figure 6. 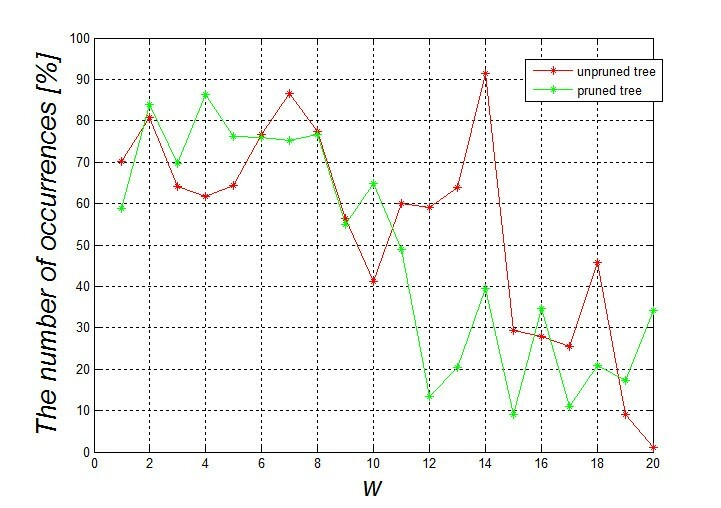 Based on the ROC graph and the complete decision tree, it can be concluded that there is a negligible impact of the features w(11) to w(20) on the obtained results. Additionally, the sensitivity of features to changes in the decision-making threshold value is the smallest for the feature w(11), and the highest for w(8) (Figure 6). For this reason, decision trees were created for each configuration of features, thereby forming 220 full decision trees (unpruned trees) and the same number of cut decision trees (over two million decision trees in total - 2′097′152). Figure 7 shows the graph of cost relationships (misclassification error) as a function of stratified cross-validation and resubstitution. The graph was also shown by computing a cutoff value that is equal to the minimum cost plus one standard error. The best level computed by the classregtree test method is the smallest tree under this cutoff (best level = 0 corresponds to the unpruned tree). The best results obtained for the complete decision tree are shown in Table 2. The best results of ACC 2 = 0.83 were obtained for the features w(1), w(2), w(3) and w(4). ROC Chart (Receiver Operating Characteristic). The graphs show the impact of threshold values for individual features w(1) to w(20) for the different imaging types Z 1 , Z 2 , Z 3 . A negligible impact of the features w(11) and w(20) on the obtained results can be inferred here. In addition, sensitivity of features to changes in decision-making threshold values is the smallest for the feature w(11) and the highest for w(8). 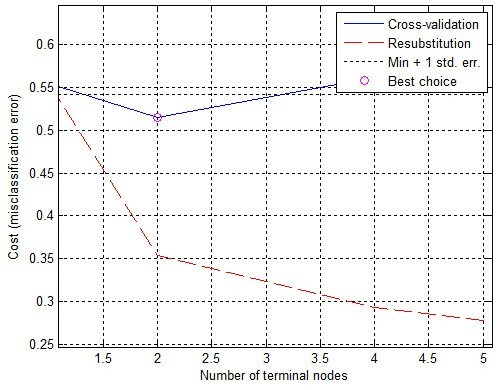 The graph of the cost relationships (misclassification error) as a function of stratified cross-validation and resubstitution. The blue shows the cross-validation error. The best choice, the place of decision tree trimming is circled as the closest cut below the minimum error value plus a mean square error (min + 1 std. err). *The occurrence of a given feature w is indicated by “1” and its lack by “0”. In the classification of groups Z 1 , Z 2 , Z 3 the features from w(9) to w(12) as well as from w(18) to w(20) did not occur. This means that their influence can be neglected for the best classifications (top 3 results). These features (from w(9) to w(12) as well as from w(18) to w(20)) define the average location of the centre of gravity for i = 9 and 11 in the x-axis, for i = 3, 5 in the y-axis and the standard deviation of the average brightness of pixels of all objects for i = 9 and 11. The same results of ACC2 were obtained for various configurations of the features w(1), w(2), w(3) and w(4) or w(5), w(7), w(8), w(16) and w(17), which is also quite interesting (Table 2). The best results for the cut decision tree are shown in Table 3. ACC 2 = 0.82, obtained for the features w(1), w(4) w(5), w(7) w(8), w(12) and w(15), is the best result for the cut decision tree. The results for the groups Z 1 , Z 2 , Z 3 confirm that the features from w(17) to w(20) have the smallest influence. The summary frequency chart of the occurrence of individual features from w(1) to w(20) for the cut and complete decision trees for the first 1′000 best results is interesting (Figure 8). It shows the greatest frequency of occurrence of the feature w(14) for the complete decision tree and the feature w(4) for the cut decision tree. From a practical standpoint, however, minimizing the number of features occurring in the classification seems to be the most vital. Therefore, when analysing only the three top results for the cut decision tree, one feature for Z 1 , six features Z 2 and one feature for Z 3 are obtained. This means that only the group Z 2 requires the largest number of features in the classification. This information is essential for optimizing the computational complexity of the algorithm. The analysis time for a single image does not exceed one second for the Pentium 4 CPU 3.0 GHz, 8GB RAM. The graph of occurrence frequency of individual features w (1) to w (20) for the complete decision tree and the cut one for the first top 1′000 results. The graph shows that the highest occurrence concerns the feature w(14) for the complete decision tree and the feature w(4) for the cut decision tree. The occurrence frequency of the features corresponds with the results shown in Tables 2 and 3. The analysis of the choroidal layer is dealt with in a number of publications [20–23]. In most cases, however, it is qualitative analysis. It includes the analysis of the choroidal layer thickness  or analysis with the use of Heidelberg Eye Explorer software . In the first case, central serous chorioretinopathy case-series is presented. The following results were obtained – mean subfoveal choroidal thickness was significantly (significance level p sl = 0.04) larger in the affected eyes (455 ± 73 μm) than in the contralateral unaffected eyes (387 ± 94 μm), in which it was significantly (p sl = 0.005) larger than in the control group (289 ± 71 μm). The control group and the group of patients in this case  comprised 15 + 15 patients. The largest vessel diameter was significantly (p sl < 0.001, correlation coefficient: 0.73) correlated with the thickness of the total choroid. A similar small number of patients was analysed in . The described software enables to measure some features of the choroid. However, this method is fully manual. Another interesting analysis is shown by Mrejen S. in . The results obtained there concern the use of various imaging techniques in the diagnosis of the choroid. An automatic method for the analysis of the choroid is shown in the work of Park S.Y. . The analysis presented there concerned only determination of the location of the selected layers in the tomographic image of the fundus. In addition, the correlation between the early treatment diabetic retinopathy study and EDI (enhanced depth imaging) was demonstrated. The automatically measured retinal thickness and volume of 9 early treatment diabetic retinopathy study subfields with conventional and EDI raster scan showed an intraclass correlation coefficient of 0.861 to 0.995 and 0.873 to 0.99 respectively. The number of analyzed cases was 35 patients with chorioretinal diseases and 20 healthy subjects. In this paper, the number of cases is much higher and the image analysis and processing are fully automatic. It seems that useful results can be obtained even with non-EDI SOCT. However, it should be further tested with other devices. 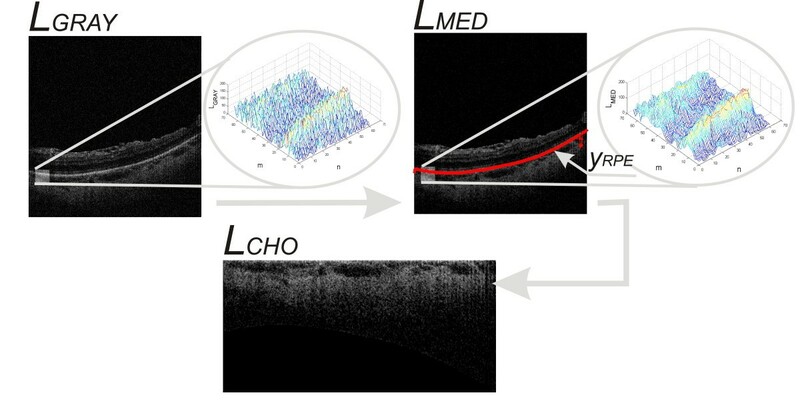 This paper shows a new fully automated method for the analysis of choroidal images. A division into three types of choroidal images was proposed. The created decision tree enabled to obtain satisfactory classification results. For example, for the classification of images Z 2 , the accuracy ACC 2 was 0.81 (pruned tree). 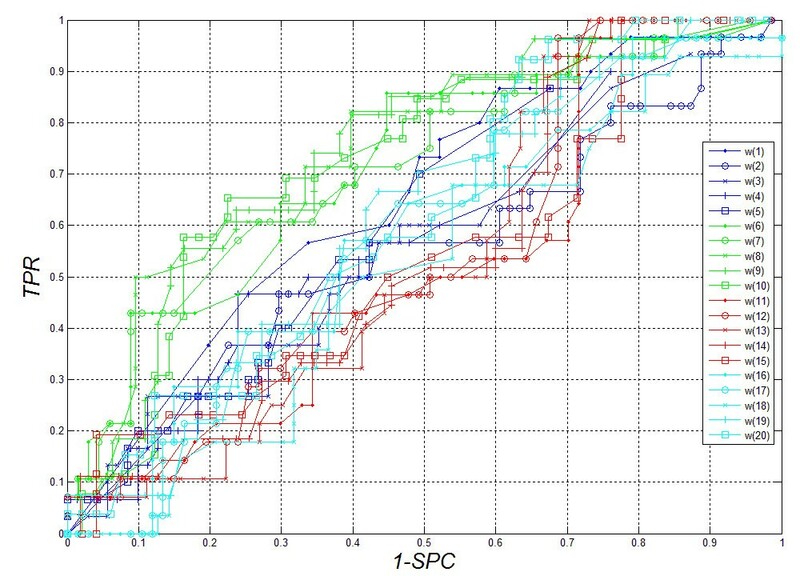 Additionally, the features which have the greatest impact on the classification efficiency were characterized (creating more than 2 million decision trees). These are the characteristics from w(1) to w(9), w(12), w(15) and w(16) which are responsible for the number of objects in the scene and the average position of the centre of gravity in the x-axis for i = 3, 5, 7, 9 and the average position of the centre of gravity in the y-axis for i = 5, 11 and STD for i = 3. In addition, it was shown that for the adopted classifier of the cut decision tree, for the top 1′000 results the feature w(4) was most common. It was also noted that the different locations of scanning differentiate the images of the choroid but the classification result remains the same. Foveal location, however, has the greatest ability to differentiate changes. Individual B-scans located on the macula periphery are closer to each other. The proposed algorithm for image analysis and the classifier were implemented in the C language. Currently, the application is further studied in the Clinical Department of Ophthalmology in District Railway Hospital, Medical University of Silesia in Katowice, Poland. The presented methodology of the procedure does not cover a large range of opportunities offered by modern methods of image analysis and processing. Currently, there is ongoing work on the optimization of the algorithm in terms of computational complexity. Moreover, its aim is to replace some of the time-consuming functions with some other more efficient ones. In particular, the possibility of applying different methods of texture analysis [23–31], Boolean function  or other methods of image analysis [33, 34] or the impact of other factors [35–41] is considered. Other types of classifiers ensuring the analysis of other characteristics acquired from images are particularly taken into account. RK suggested the algorithm for image analysis and processing, implemented it and analysed the images. ST, EW, ZW performed the acquisition of the OCT images and consulted the obtained results. All authors have read and approved the final manuscript.